British Pathé was once a dominant feature of the British cinema experience, renowned for first-class reporting and an informative yet uniquely entertaining style. Now considered to be the finest newsreel archive in the world, British Pathé is a treasure trove of 85,000 films. And they are all uploaded on YouTube to watch for free. In the archive there is marvellous, one-minute clip of Khiva circa 1937 (below). It shows tantalising shots of minarets and courtyards, men wearing their big, woolly telpeks astride donkeys, and artisans of Khivan applied arts. Khiva today still prides itself on its artisans. As you wander the backstreets you see felled trunks of elm, walnut and apricot trees outside homes - a sure sign that within is a woodcarver with young apprentices. The design is drawn on paper and placed on the wood. Then the pattern is pin pricked through. More experienced workers then chisel and carve the ancient patterns as their ancestors did. 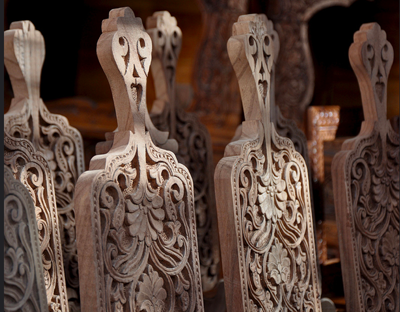 Former madrassahs have been converted into woodcarving centres and you can watch the process. Happily there is still a market for superbly carved columns, doors and beds: trade is flourishing. Smaller items such as pencil boxes, book stands, cutting boards, jewellery boxes and walking sticks make perfect souvenirs of your visit to Khiva. Thanks to Uzbek Journeys client Frank Villante for alerting me to this clip.